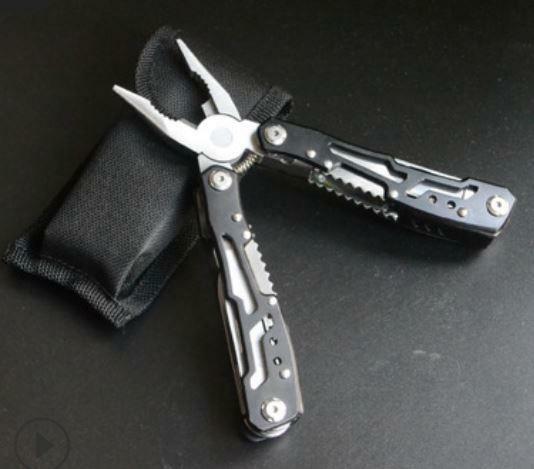 It is a well-built pocket-sized suspension multitool plier that provides an excellent selection of everyday tools and can be carried easily while hiking, hunting, fishing, backpacking or during your daily life. *Whether you want to rig your fish tackle, restring your guitar, cut some wires, fix a bike, or do some pruning in the garden using the razor-sharp, high-efficiency saw, these suspension multitool pliers does it all and much more! *High-quality engineering guarantees years of reliable performance. Made from hardened stainless steel, heat treated to make it ultra-tough. Comfortable, 3D machined grip texture provides reliable non-slip grip. Comes with a durable sheath/belt holster. *This marvellous portable tool comprises of the 14 most useful everyday tools: internally reinforced spring action pliers, wire cutters, wire stripper, can opener, bottle opener, mini, medium and large slotted screwdrivers, Phillips head screwdriver, a large knife blade, leather punch, metal file, a saw with fish hook remover and a safe locking mechanism. *SAFE AND EASY TO USE – All of the extra tools locks into place when fully deployed and must be manually unlocked to fold away. This provides a much safer user experience. Also, all of the tools are accessible while the multi tool is in its folded or closed position, mimicking the functionality of a pocket knife.